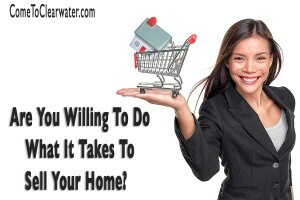 Are You Willing To Do What It Takes To Sell Your Home? It’s time to sell your Clearwater home, are you willing to do what it takes to sell it? Do you even know what to do? Even just the basics? Well, here are some things you should do if you are willing to do what it takes to sell your home. Ok so first, take a look at your refrigerator. Yes, really, your refrigerator. What’s on it? Is there a collection of clutter on top of it? Cereal boxes? Extra containers? What about on it? A dozen magnets? Menus? The latest art project or projects from your kids? Not what prospective buyers need to see. It’s a bit hard to see themselves in your kitchen if it looks like your kitchen! Next, walk room to room and look at the state of the walls. Are there holes, dings, cracks or other things that should be fixed? Remember that really ugly picture you took down? Well, the hole from the nail holding it up should probably be spackled. If you were buying a home would you want to buy one that obviously needed some work to be done? Cracks and holes are signs to a buyer that you might just be leaving other things undone. As you look at all those walls check the paint? Remember when your kids had you paint their rooms all those wild colors? What about that dark “accent” wall gone awry? Yeah, it might just be time to make all that just a bit less wild and a bit more neutral. You might have liked having your living room colors of your favorite football or baseball team, but your buyer might not! Ok, last thing. Sweep up the dog hair and pick up the kid’s toys. Who wants to step over toys or watch the dust bunnies blow around as they look at your home? I bet they don’t come back to look again! So do what you have to do, and mostly listen to your Realtor when they tell you what really needs to be done to sell your home! If you’re looking for great condo living in Treasure Island, Florida, Paradise Island Towers is for you. A treasure in paradise for those on a budget. Paradise Island Towers is located at 10355 Paradise Boulevard in Treasure Island, Florida. The building was originally built in 1963 and has both 1 and 2 bedroom units. 1 bedroom units are about 850 square feet and asking prices range from $130,000 to $150,000, two bedroom units are about 1050 square feet and asking prices range from $150,000 to $220,000. Prices will vary based on views you have and what floor the unit is on. Units are bright and airy, immaculately maintained and in “move in” condition. The building has great amenities, including a doorman, waterfront deck, a large gorgeous heated pool and boat slips available to rent suitable for sailboats. This is Florida real estate at its best! A two bedroom unit is bright and spacious. You walk into a living room/dining room combination with a good sized kitchen. There are also a spacious breakfast bar, a dishwasher, stove, microwave and refrigerator. There is a utility room/laundry room right off the kitchen. Paradise Island Towers units have a nice sized balcony with great water or park views. The guest/main bathroom is a nice 3 piece bath with tiled floors. The units have a lot of storage, including closets in the hallway. The master bedroom is large and has great water views. It also has its own 3 piece bath. The guest bedroom is large enough for a queen bed, and also has great water views. The units are carpeted throughout. While Paradise Island Towers units may need some updating, paint and new carpeting, none of it is necessary for function. Units are in great condition and are ready to move in. 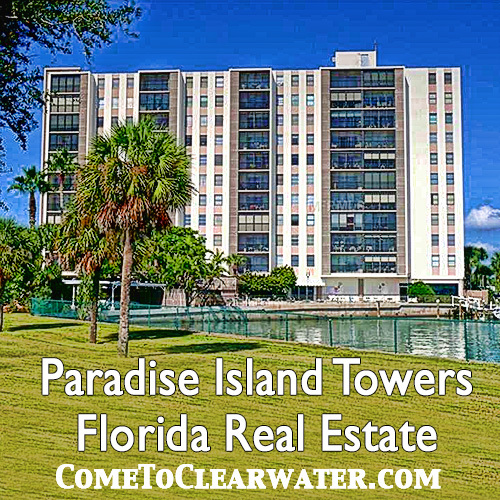 For a tour or more information on Paradise Island Towers or other Florida real estate, contact Deb Ward, the Irish Realtor. Check out one of the units that we have listed here! If you’re looking for Florida condo living at its best, look no further than The Lido. This Gulf front real estate has amazing views from every unit. The best of St. Pete Beach living without the hassle of taking care of outside space! Who could ask for more? 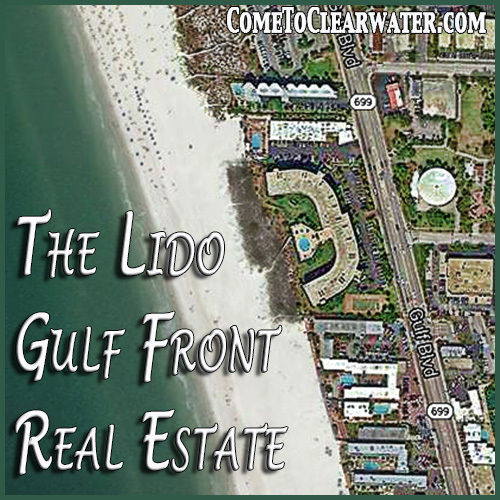 The Lido is a high rise condo community located in St. Pete Beach, Florida. It has 74 units on 5 floors. While all of the units are spacious, most units have 1692 square feet. There are exceptions; there are a few with 1550 square feet and a few penthouse units that have 3417 square feet. The large 1692 square foot units have 3 bedrooms and 2 baths, the cozy, yet roomy 1550 square foot units have 2 bedrooms and 2 baths. The huge penthouse suites have 4 bedrooms and 3 baths. The Lido has a condo sized for singles or families. Prices range from $475,000 for a smaller unit to $975,000 for a penthouse suite. The Lido is built in a U-shaped architecture that ensures that every single one of the 74 units has a gorgeous Gulf front view. The grounds are meticulously landscaped, green and lush, and beautifully kept. The community has great amenities, including a stunning Gulf front heated pool and spa, well provisioned exercise room, tennis court and off street, under building parking. The units themselves are updated, sleek and modern with high end finishes. A modern tone on tone, sophisticated design. Bedrooms have space saving built ins with drawers and cabinets. The spacious bathrooms, including spa like master ensuites with dual sinks, are also modern and stylish. There are in unit washer dryer combos for convenience. Style and function go hand in hand in these great condos. FSBOs Tips – Why We Love FSBOs! FSBO’s, or homes for sale by owner, are not a realtor’s nemesis, quite the opposite! In Clearwater, Dunedin and St. Pete we love them. Deborah Ward, the Irish realtor, knows that it can be hard to list your home on your own, and has some great tips to help you out. “Why” you ask yourself “would a realtor help me sell my home myself?” Well, maybe because she knows that she just might have a buyer who would love your home. She hopes that even if you decide not to use her listing services, you might know someone whom you can refer in Clearwater, Dunedin or St. Pete. She also knows that you might just decide to have her list your home. So why not share some great tips! 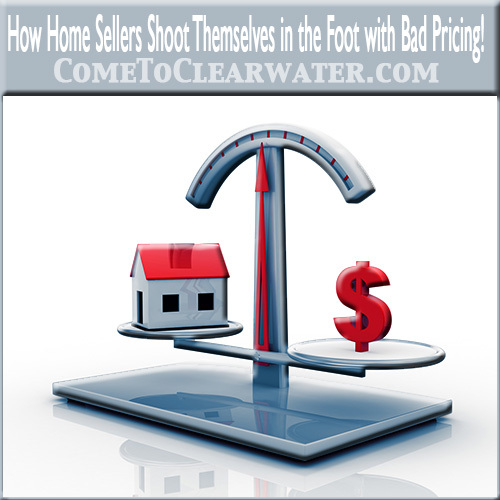 The first thing sellers think about is how to price their FSBO. Most sellers think their home is worth more than it actually is. Many sellers look at asking prices of homes that they think are like their own and set their price based on that asking price. This is a huge mistake. Your best bet is to have a professional come in and let you know the actual value of your home based on how it looks, what it has and not what you think. It might not be what you want to hear, but priced right it will sell more quickly. Another common mistake FSBO seller’s make is showing their home to anyone who shows an interest. If you do that you are wasting your time on a lot of people who won’t be able to afford your home. They are unqualified. At the very least, ask people who want to see your home for proof they have been prequalified for a mortgage. Then ask if they have a home that they have to sell before they can purchase your home. If so, is it under contract? A realtor in Clearwater Dunedin or St. Pete would do all of this for you. They would pre-qualify prospective buyers so that their time and yours won’t be wasted. So don’t be afraid to ask for help. Even if it’s just to get advice or a home value, you never know if the time will come when letting a realtor help can be the answer. Largo FL is a neat little town nestled between big sisters Clearwater and St. Petersburg Florida. With a charming little downtown area, city park, gorgeous library system and many perks to offer at a lower price point than “the big cities”, Largo is on our top list of fun listings! We are pleased to present a modern townhouse for sale, located in a gated gated community at 10610 Whittington Court. This property features a gourmet kitchen, bonus room that could be an office and a master bedroom with a bay window on the first floor. A super clean end unit like this one is a rare find indeed! The kitchen has stainless steel appliances and granite countertops. A freshly painted interior and volume ceilings add to the overall livability and a great layout puts the icing on the cake! This comminity offers many amenities including a clubhouse and a pool (which are steps away from your front door!) Save some money and time buy ditching the gym and using the onsite fitness center. Homeowner fees include ground mainteance, the recreational facilities, the building exterior, roof, and trash removal.